In the morning, the sun bore down on the tents baking the inhabitants and forcing them to rise early. Following the refugee feeling outside the border to ‘Paradise,’ it has to be said the camping at festival very much resembles a refugee camp. Thousands of mismatched tents packed close together. The major difference is that the festival goers are very happy, healthy and don’t fear leaving because of persecution. Although some of them will have to tidy their rooms when they get home. We kicked aside the cold barbeque to realise that it had cooked something. A small square of burned grass outlined where it had stood. It seems the design of the barbeque was to cook what lay underneath it not, what we put on top. It wasn’t a good start to the day. Nor were the queues for the toilets and showers. Lowlands presents you with a dilemma. At most festivals, the toilets are unvisitable after the first hour, and showers, if there are any, are so rare and delicate that if you queue for one the moment you arrive you might get one by the end of the weekend. 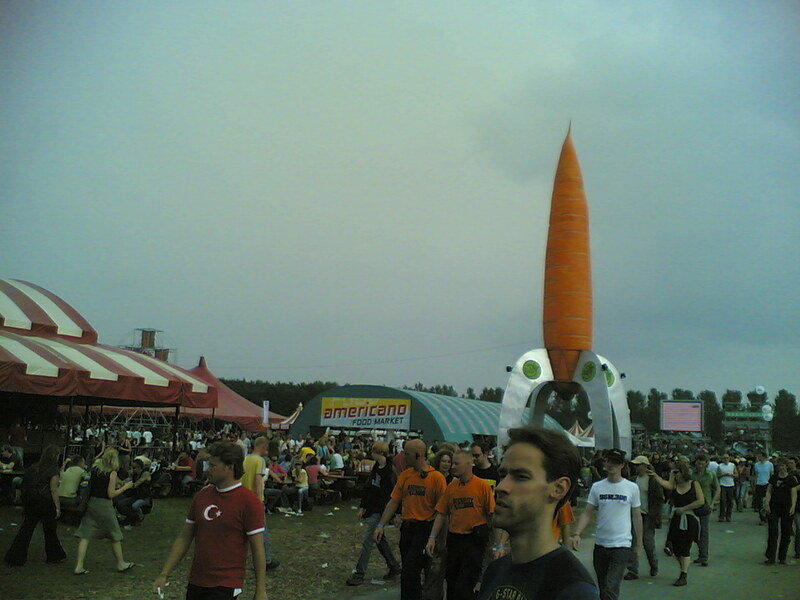 At Lowlands, the toilets are cleaned regularly and the showers work. There is the matter of queuing for them, but it is maybe 20 minutes or something like that – nothing for people who queued for 4 hours to just get in. This means that you actually want to have a shower, whereas at a festival, people usually just say, “Oh, It’s impossible,” and feel content to not be as fragrant for a few days. After all, everyone is in the same boat. The first band of the first day was the perfect warm-up band. The Beatsteaks, German punksters with a sense of humour who aren’t ashamed to show their influences. They woke up the crowd and did great versions of both Rappers Delight (ironically as far as I could tell from that distance) and Sabotage by the Beastie Boys. The latter being a faithful barnstormer done without samples. The Polyphonic Spree (hippy musical band – think Hair) and The Magic Numbers (Fat 60s retro group (think Mamas and Papas) who don’t like being called Fat, so don’t say the word ‘Fat’ in front of them) were wandered by before a little time was spent watching KT Tunstall, Scottish balladeer with some good songs. The Kaiser Chiefs were next up, and as ever were their usual cheeky selves. Good songs, entertainingly delivered. The Bravery were too far away to make and eat, so were skipped. But think New Order in their rockier moments. The second Germanicly-name Cheek-rock band to take he Alpha stage were Franz Ferdinand, who proved why they were further up the bill than the Kaizers. It was good to finally see the Ferdies live. The next band we saw were aging punksters Social Distortion, who I knew a little but had failed to really get into. They came on and said “Hello Belgium” and acted so much like they had something to prove that they were somewhat of a disappointment. Fortunately The Prodigy, who are always at festivals, and expected to find nothing special this time, thoroughly rocked the joint in a way most rock bands would kill to do. Plans to party all night were abandoned for at least my small party in favour of obeying my protesting body. Others did party all night, but that’s their story.